Submitted by bigblock on Wed, 05/08/2015 - 14:15. That looked like a lot of fun and covered some interesting routes. It is a shame that you did not have more members participating. I have looked around the website but it is not obvious where forthcoming events can be advertised so that everyone can see them. I will speak to the committee and see if we can improve this so more members are more aware of these types of events. Submitted by Spider1V on Wed, 05/08/2015 - 09:25. Great looking session, had by all, by the look of things. Adrian, nice to see you back in blighty and wonderful to see Alex and Julie enjoying themselves. As ever, great work Kevin! Though I love your son's face.... 'hmmm maybe I drew the short straw on this one' LOL. Submitted by cox.adrian on Fri, 31/07/2015 - 18:14. Submitted by g wagon g on Sun, 02/08/2015 - 21:52. Submitted by cox.adrian on Mon, 03/08/2015 - 08:00. Submitted by g wagon g on Mon, 03/08/2015 - 22:01. Submitted by fraj on Mon, 03/08/2015 - 00:51. Many thanks Kevin for a great day out on the Sunday. Only sorry that work commitments prohibited the other two days. Julie and I can endorse the hotel recommendation. Excellent food, first rate rooms and the friendliest of people. Appreciated all the hard work by Kevin son opening and closing all those gates. 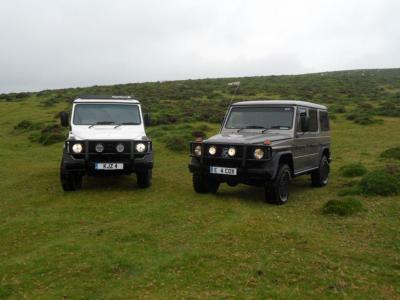 Although only three G Wagens but with Adrian and Kevin the day could not have gone better.